The yellow spaghetti squash is at the top. It’s related to pumpkins and zucchini. 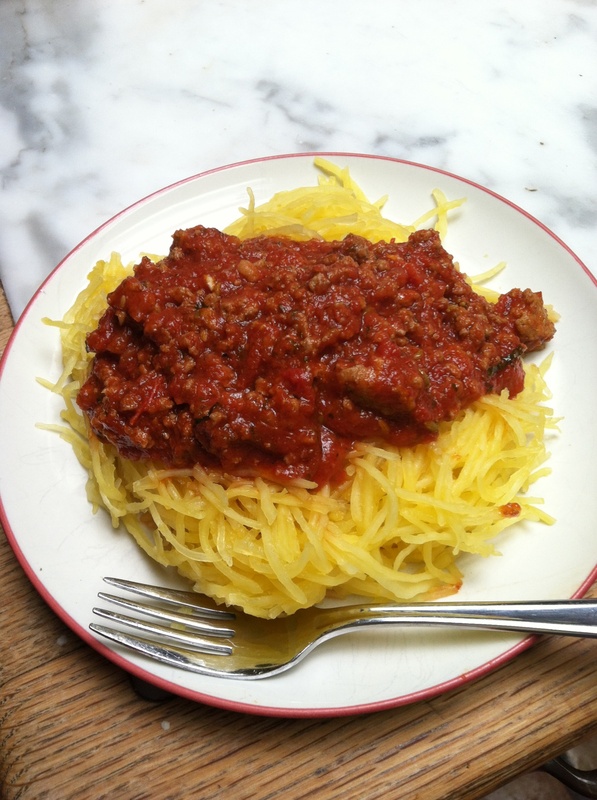 Spaghetti squash is a classic low-carb vegetable. If you’ve never tried it, you should. As vegetables go, it’s one of the largest, heaviest, and most interesting to prepare. Easy, too. 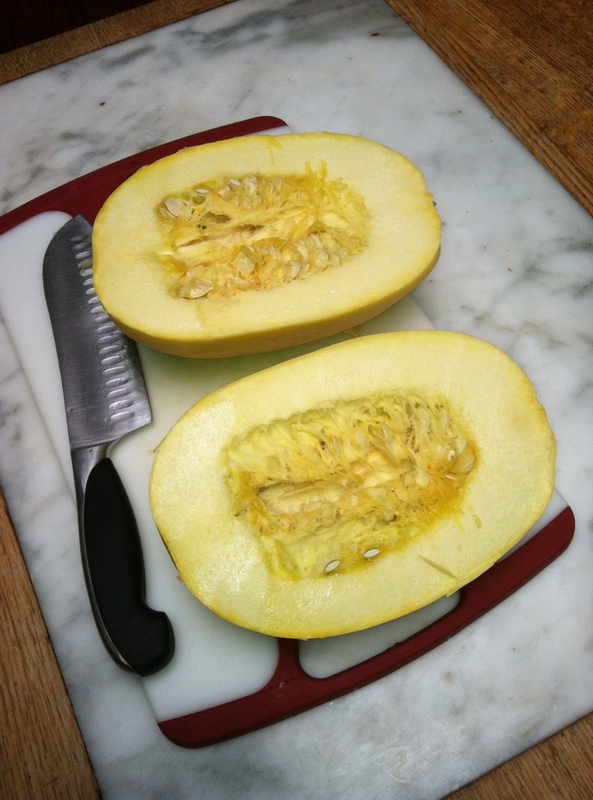 The spaghetti squash season is autumn and winter in the northern hemisphere. Purchasing in spring and summer may be iffy. It’s hard to give up pasta. Many diabetics who don’t notice that their blood sugar levels spike too high when they eat pasta. What’s too high? In general, I’d say over 150 mg/dl (8.33 mmol/l) measured one hour after a meal, or over 130 mg/dl (7.22 mmol/l) two hours after the meal. Other experts disagree and propose other numbers. An alternative to spaghetti pasta that shouldn’t raise blood glucose levels as high is the aforementioned spaghetti squash. It’s all about the carbohydrates. 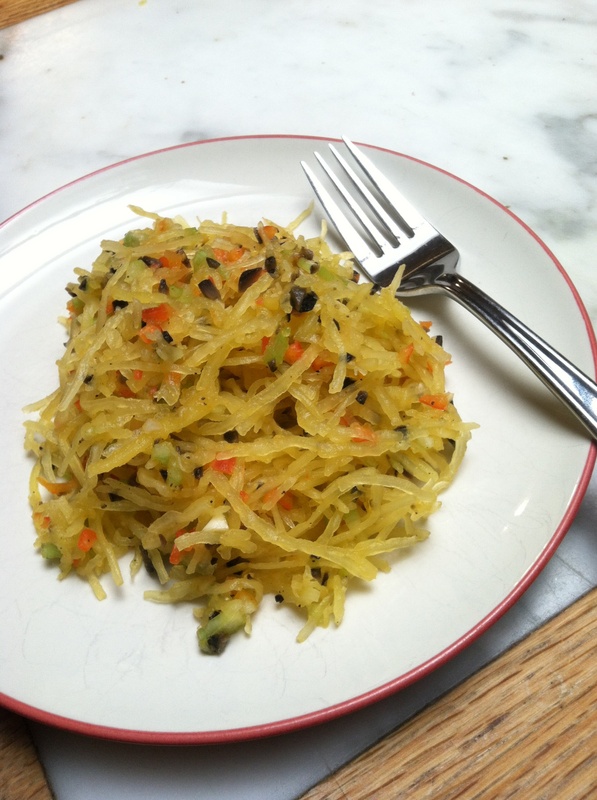 A cup of cooked spaghetti squash has 10 g of carb; a cup of cooked spaghetti has 43 g. The fiber grams are about the same. Numbers are from FitDay.com. In my part of the world, supermarket spaghetti squashes weigh between two and five pounds. We cooked a three-pounder (1.4 kg) that yielded five cups; a five-pounder (2.3 kg) gave us 12 cups. A serving size is one, maybe two cups. What you don’t eat immediately stays fresh in the refrigerator for at least several days. Re-heat by microwaving or stir-frying. Like pasta and potatoes, the squash by itself is bland. It’s a great substrate for sauces or seasonings. 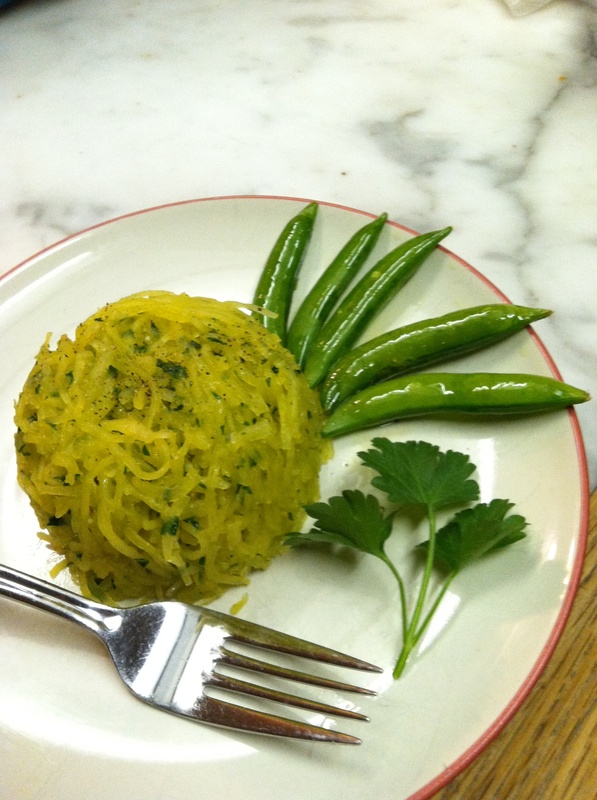 You can fit spaghetti squash into both the Ketogenic Mediterranean Diet and Low-Carb Mediterranean Diet. Here’s how we cook it at the Parker Compound. Preheat the oven to 375º F 0r 190º C. Very carefully slice the squash in half lengthwise. Spoon out and discard the guts (seeds and membranes like a pumpkin; it even smells like a pumpkin). Put the halves flat-side down in a pan, then add a half inch (1.3 cm) of water to the pan. Cover with foil and bake until the outer shell (rind) is fairly easily pierced with a paring knife. 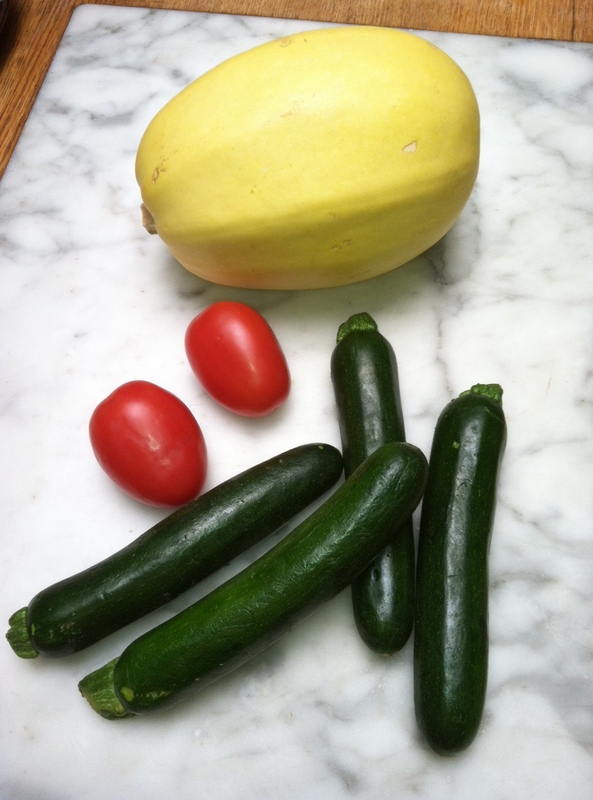 This will be about 45 minutes for a two-pound squash (0.9 kg); 90 minutes for a four-plus pounder (2.3+ kg). Then turn them over, re-cover with foil, and cook 15 minutes more, until very tender. Remove from the oven and allow them to cool for a few minutes. Then use a fork to pull the strands away from the rind. Other cooks simplify the process and just place the squash halves flat-side down on a baking sheet and cook for 30-60 minutes. Some leave the seeds in while cooking and spoon them out just before the stranding step. Our first experiment was with l0w-carb spaghetti sauce. Next we took three cups squash (710 ml) and mixed in 2 tbsp (30 ml) extra virgin olive oil, 2.5 tbsp (37 ml) chopped parsley, 1/2 tsp (2.5 ml) minced fresh garlic, 1/2 tsp (2.5 ml) salt, and 1/8 tsp (0.6 ml) black pepper. Finally, we took a cup (240 ml) of the squash and added minced celery (4 inches or 10 cm of stalk), 3 minced black olives, 5/8 oz (18 g) of minced sweet (bell) pepper, 1/2 clove of minced garlic, salt (a dash), and pepper to taste. These last two options I consider side dishes. By the way, they taste good either cold or warm. They would go well with a number of entrees, such as steak or salmon. I’ve read that this squash is good with pesto, or just with salt and butter. One cup of cooked spaghetti squash has 75 calories (I’ve seen 42 elsewhere), 10 g of carbohydrate, 2 g of fiber, 8 g of digestible carb, 4 g of fat (predominantly MUFA), minimal protein, and a fair amount of vitamins A, niacin, B6, and C. Plus 8% of your RDA for manganese.